A couple of weeks ago, I was teasing my blog readers with pictures of a quilt that I was working on. I had to pull it off because (a) I had some customer quilts to do and (b) I had to figure out how to fix the crosshatching math mess I had gotten in to. After finishing some other stuff this weekend, I fixed my math problem by pretending it didn’t exist: I frogged out the cross-hatching. Luckily, it was straight line stitching, and the thread slid out pretty easily. Last year, when I was making quilts for my youngest niece and nephew, I realized that these youngster’s had older siblings who hadn’t had quilts from me in awhile, and I asked my brother and sister-in-law for an update on favorite colors. My niece’s favorite color was reported to be: HORSE. I knew that she was horse-mad, but I didn’t realize it was that bad. I got a good laugh, filed it away for future reference and promptly got busy with who knows what. 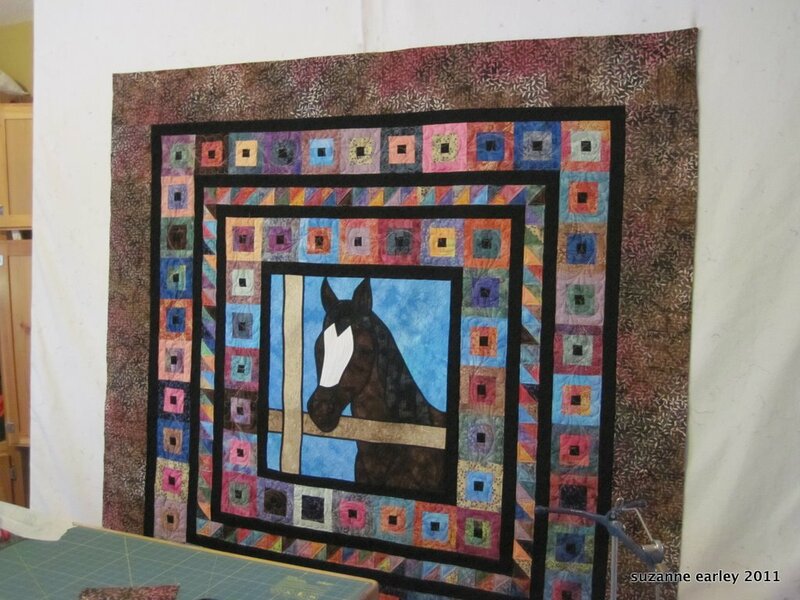 Anyway, sometimes things just have to simmer for just the right amount of time, and things finally came together for Sofia’s horse quilt: several years ago, at a quilt show, I bought a kit from Sew Batik to make a Jewel Box quilt. It had a chocolate brown background, and the jewel-toned batiks. I would pick it up every so often and put it back down, finding that I wasn’t quit in the right mood for it. Good thing, as it turned out to be the perfect fabric for this quilt. I had to supplement the jewel tones with some bits and bobs of leftover Sew Batik that I had floating around, the border fabric was originally the backing fabric from the kit. 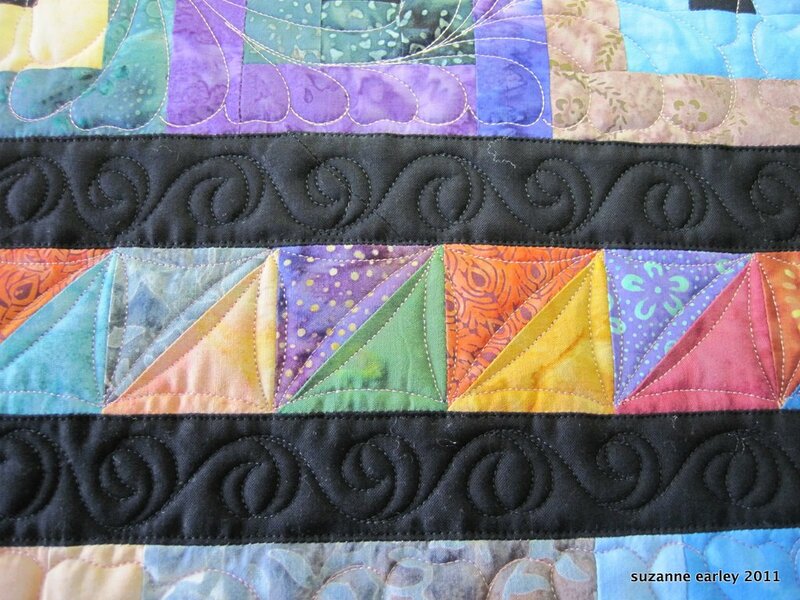 It needs to be washed, blocked and bound, but having the quilting done is a big hurdle. Can you see why I was so pleased? I hope Sofia loves it as much as I do. Gosh – if she doesn’t, I volunteer to be your niece!!! That is gorgeous! Oh Suzanne, I want this one, could you give me the name of the pattern for the horse…..please! Kay, I’ll e-mail this to you privately, in case you don’t see it this way, but I wanted the info to be here on the blog, too…the horse pattern has the highly original name of “Stained Glass Horse” — it is a Designs by Edna pattern: http://www.designsbyedna.com, although I ordered through Checker Distributors. The original pattern has a triangles in the corners for a frame, I left those off and just adjusted the pieces underneath accordingly. I have been allowed to see this special quilt in person, in the making. I gasped the first time I saw it. I can’t wait for Sofia and her mom to see these pictures. I’m certain Sofia(and her Mom) will LOVE it! Ooo! She’s gonna love this! Wow! 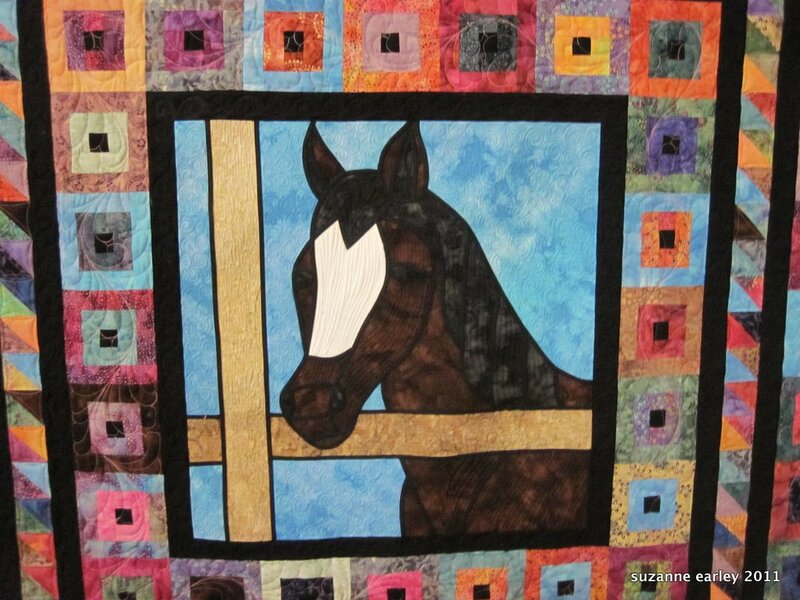 What a fabulously perfect quilt for a horse crazed girl! You’re a great Auntie!! Are you snowed in? The weatherman has been predicting lots of the white stuff for much of the midwest and east. Your horse quilt is truly lovely. I’m sure Sofia will be thrilled. WOW!!! That is fabulous. Sofia and Stefanie freaked out when they saw the pictures. She asked to call you as soon as she saw it (you’re on the phone with her as I type this).